The clouds were spectacular this evening, both to the east of us (above) and to the south (below). Fortunately by the time it got dark there were none overhead. We also tried to spot Comet C/2009 R1 (McNaught) but had little luck as it was lost in the twilight sky. Andrew Cooper may have had more luck tonight. Hope I haven't said something wrong! There's been a noticeable decrease in the number of comments recently, I hope I haven't said something offensive or anything like that! If it's down to a lack of content, then I definitely understand, I just hope those kind enough to read my posts understand things have become incredibly busy recently and it's hard to find time to put much thought into what I write here - so it's pictures instead! Oh well, it's back on the mountain again tonight and I need to make the most of the next few visits. 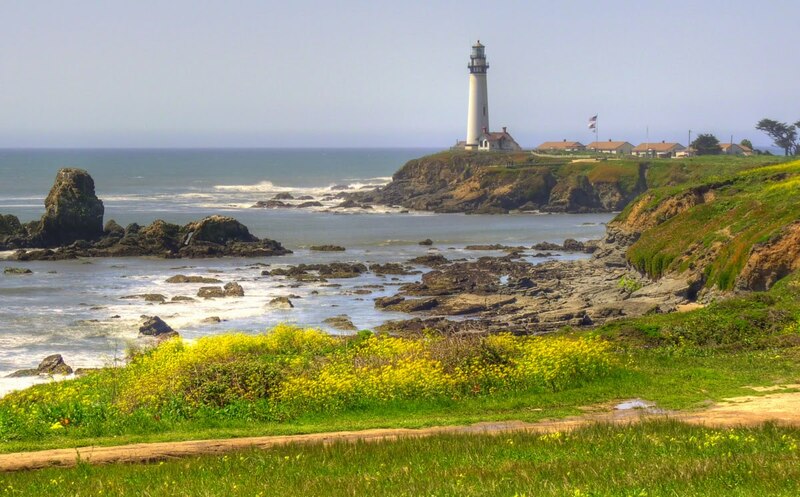 From November onwards my visits to this most amazing place will be very limited. It's easy to forget we work on top of a volcano. Mauna Kea isn't active but is classified as dormant - certainly not an extinct volcano. It last erupted around 4,500 years ago but it will likely erupt again. No one knows when. The cinder cones that litter the summit area and the rest of the mountain bear testimony to a time not long ago when the mountain spat fire. 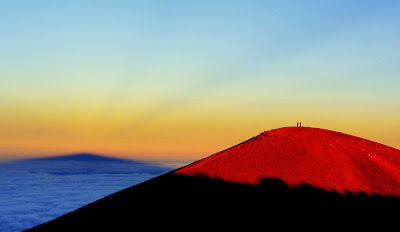 As the sun sinks below the horizon astronomers at Mauna Kea's summit start to work, the tourists leave for lower altitudes and the sky takes on some amazing colours. There comes a time when the light from the sun can no longer illuminate even the highest clouds and it tends to happen very quickly. One moment the cirrus clouds are bright red and the next they're a dull grey. On occasion I catch the moment when day turns to night but it's not often. In this case you can see the dark clouds above and the brilliantly lit clouds off in the distance. In a few more minutes the distant clouds will be dark as well and shortly after that the sky will be dark. You wouldn't even know there are clouds there. Well, you would if you're an astronomer working at one of the telescopes. 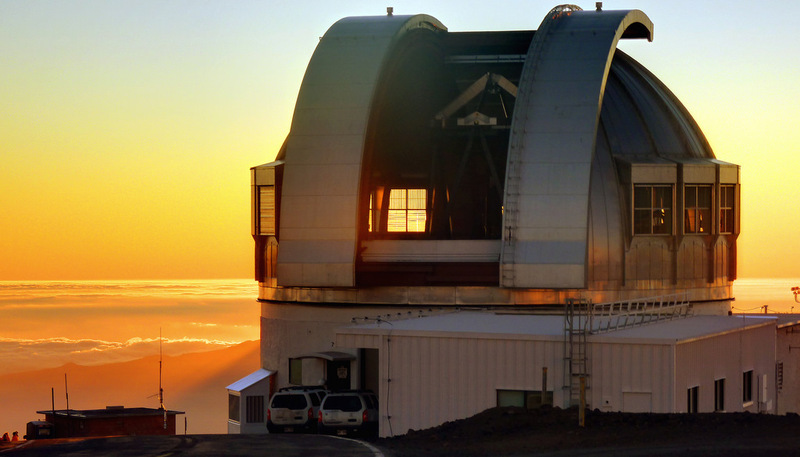 Our data reduction pipeline shows that the stars aren't as bright as they should be, it even tells us by how much, so it's time for a backup plan until the clouds go away. And an awful lot of vog. One or two people have said they're not bored of summit photos just yet. So here are a couple more. Just be aware that I'm running out of photos again! 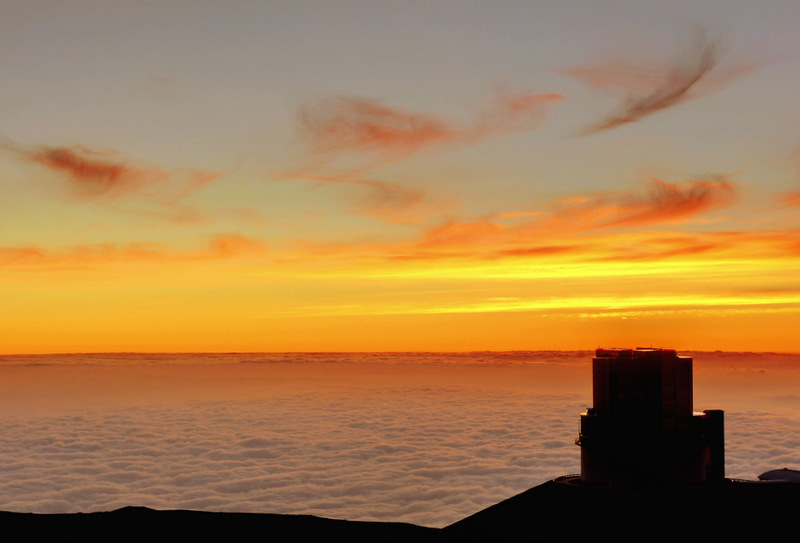 Above, the Subaru Observatory is silhouetted against the late evening sky and cirrus clouds to the west. It's way after sunset but enough light from the sun gets though to make the high clouds look nice. A rare photo of Subaru actually opening at sunset. They always seem to open much later than the other observatories. I'm not sure why. 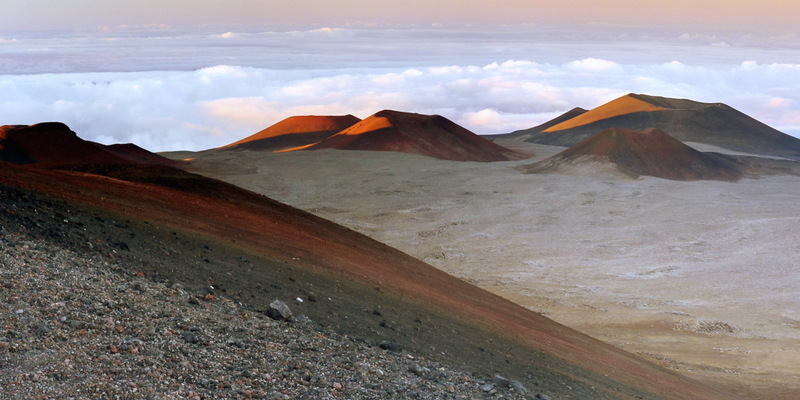 What's even rarer is the Kohala coastline being visible from the summit. As you can see in the top photo it's usually hidden by clouds. I've been trying to update my flickr account with recent pictures. I seem to have less spare time than ever before but found an hour or two to catch up. Fortunately I'm no longer on dialup! It's well after sunset but the horizon still shows the glow from the sun, at least on long exposure photos! 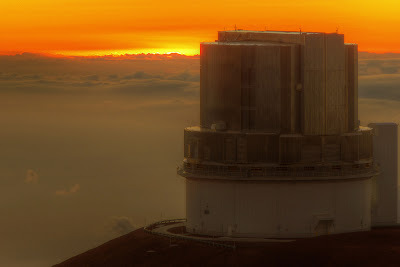 Subaru is the telescope in the foreground. 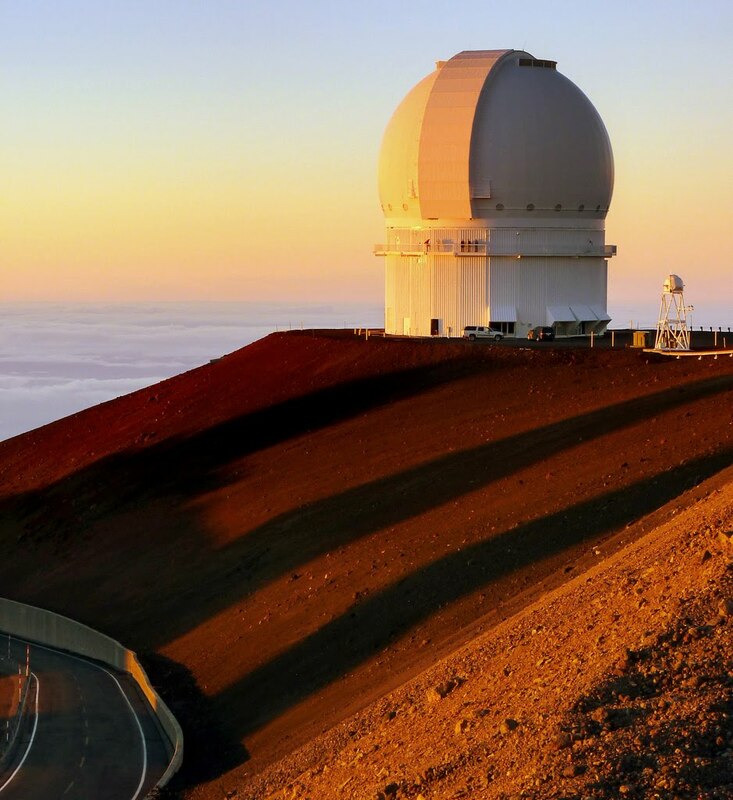 The dome is metallic coloured and often turns a golden colour at this time of night if there are high clouds around to reflect the red light. On this occasion, however, the sky is clear and the dome takes on a less interesting grey/silver colour and a lot less contrast to play with. Remember you can click on the picture for a larger version. The clouds in the distance look quite interesting. You can see a full screen version by clicking on California Road Trip April 2010. Some of us start the night shift early. The dome is opened well before sunset to help equalise temperatures inside and outside the dome. Sometimes the IRTF, pictured above, is opened early as it's observing a planet that's only visible during the day. 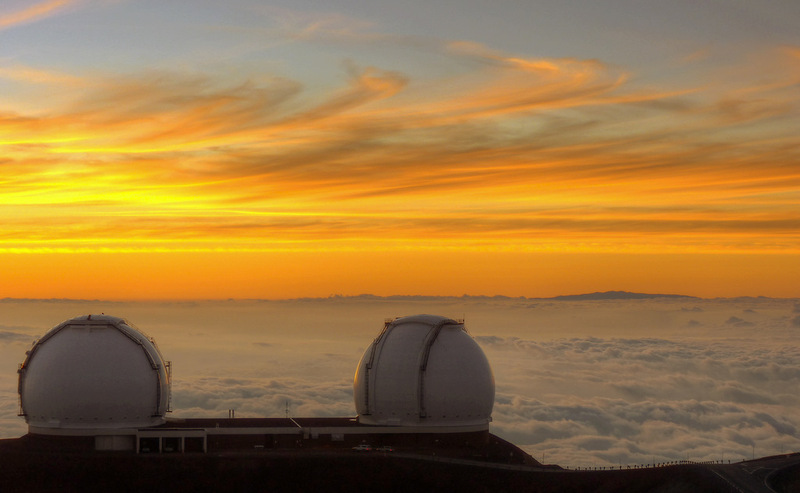 Other observatories tend to wait until after the sun has set, the Kecks being an example. Although I'm not familiar with the Keck's policies, one thing you must avoid doing if you open early is having direct sunlight on any of the telescope structure. Even at sunset or sunrise when the sun is low in the sky, the light from the sun will warm the structure it strikes and some expansion will take place. It'll be tiny, a few microns perhaps, but enough to effect image quality. Shortly after I took the top picture of the IRTF, I saw them rotate the dome so the aperture was pointed directly at the sun. There may have been a good reason for this, but it's certainly not something I'd feel comfortable doing. 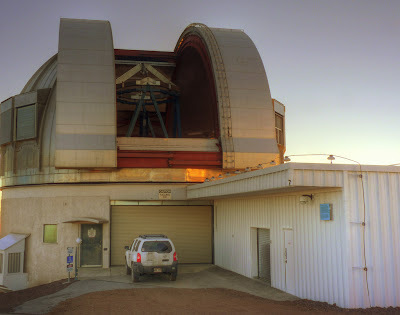 Then again, the IRTF was designed to observe planets in the infrared and sometimes that means pointing close to the sun. I don't know, I'm getting a little bored of these. Same place and usually the same time (sunset). They look nice but I need to find something else to take pictures of especially as summit time will become rare after this year. The thing is I suspect I'll be busier than ever then, so may not have a lot of time for taking photos. I don't even have the time right now unless I'm on the mountain, and then it's a limited period of time during the day. The strangest Cornish Pasty I've ever eaten? (The tea was first rate though). I'm open to some ideas and challenges! 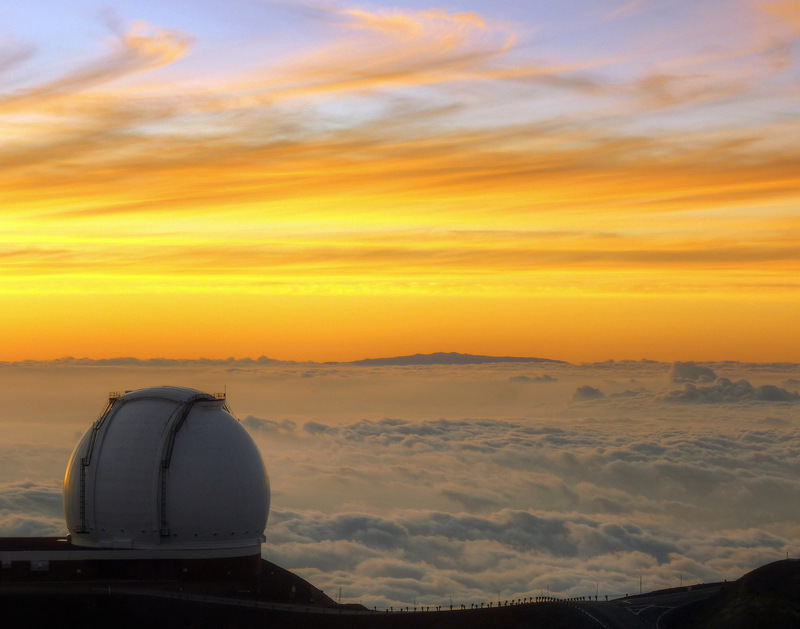 There are still a few minutes to go before sunset and the summit tourists are preparing for a treat. Most payed something like $200 to be taken to the summit with a tour company and although that's an awful lot of money they are treated very well from what I've heard. On the way down they get to see the amazing night sky from either the Visitor Center at the 9,000 foot level or the tour company will provide telescopes for viewing from some of the other dark viewing spots on the mountain. Unless you're an utter astronomy freak though, sunset is the highlight of the trip. You can watch beautiful sunsets from anywhere on the planet, but watching the sun sink below the clouds from the highest point in the Pacific Ocean is very special. I've lived and worked here nearly 14 years and I don't get bored of the view. It's very nearly 20 years since I watched my first sunset from the summit of Mauna Kea as a visiting astronomer-in-training. 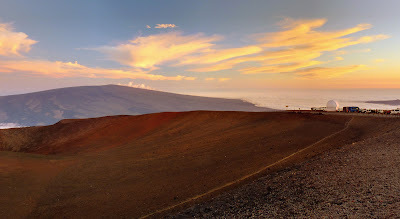 I plan to mark the 20-year anniversary by watching another Mauna Kea sunset and will post the photos here, but it's not for a few months yet! 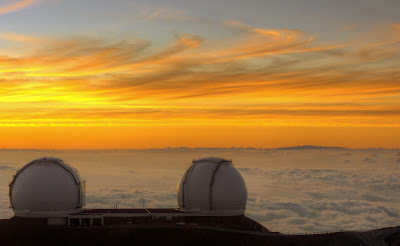 Even the astronomers and those that work at the observatories want to watch the sunset. 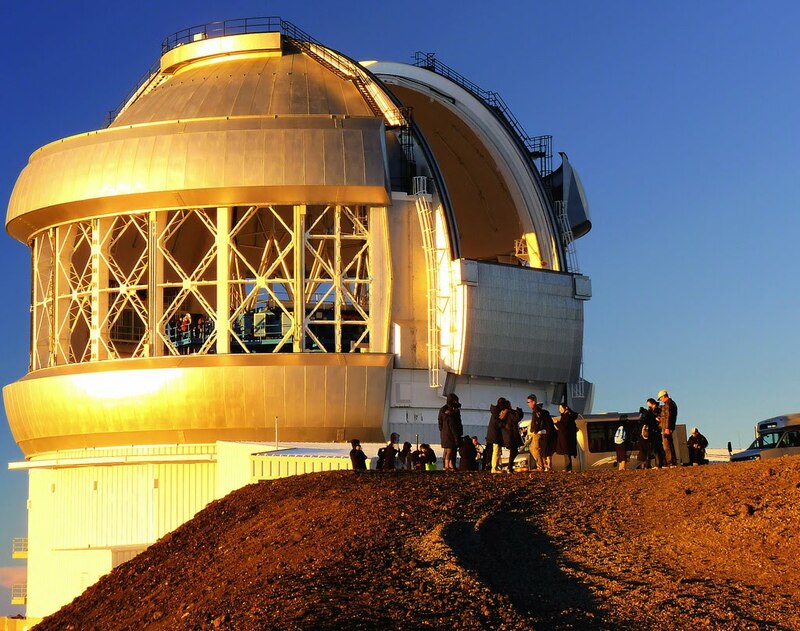 In the top photo you can just make out the staff standing by the Gemini mirror inside the dome watching the magical view, and in the one above, the observing team for the night are outside taking in another amazing evening view from the CFHT. 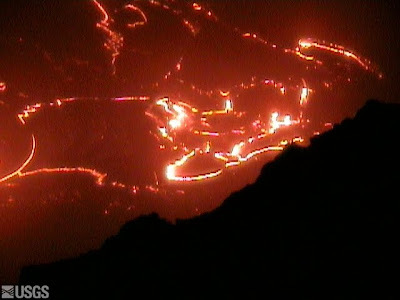 Some of this might also be due to many of the observatories planning to switch to remote operations. It's very hard to imagine that I won't be up on the summit after this year, especially after such a long career spent on the summit. The CFHT are planning remote operations as well and the rumour is Gemini are also looking at the possibility. It feels very much like the end of an era. PS. 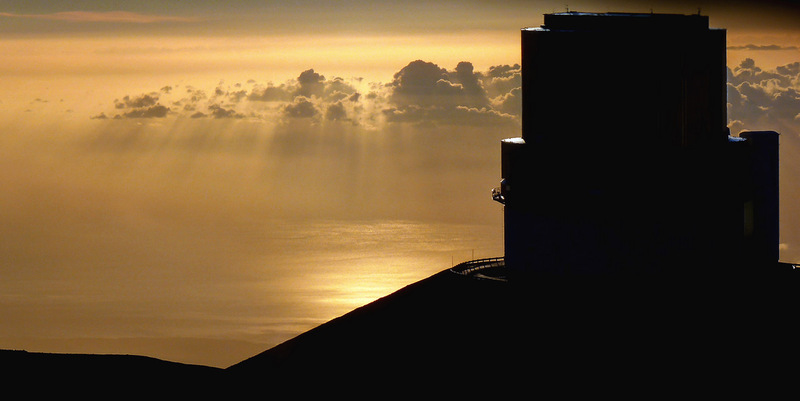 Those shadows below the CFHT are from the Keck telescopes and Subaru. Anyone know a window cleaner who's willing to work at 14,000 feet? Not my best panorama, but the sunset clouds were stunning. 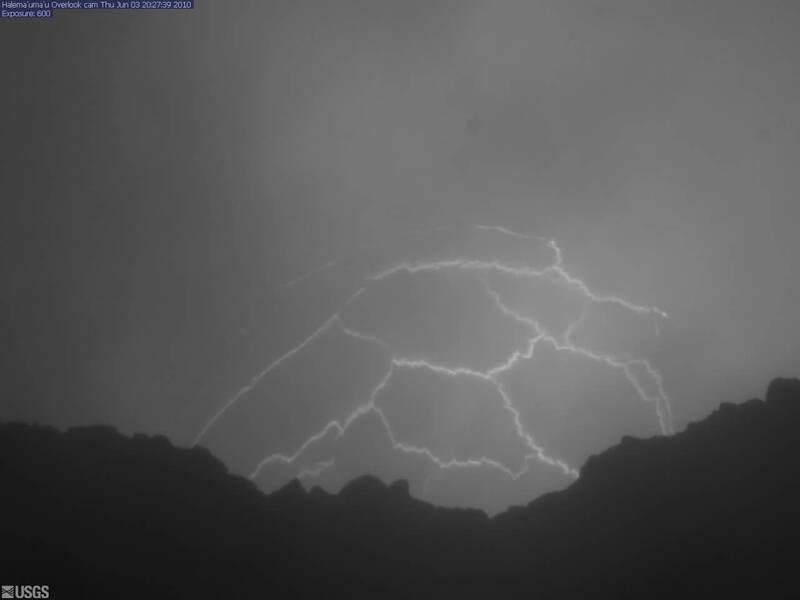 The last few nights have seen some bizarre changes in observing conditions. We've gone from some relatively average conditions (seeing around 0.6" for those who know what I mean) to absolutely stunning seeing (~0.3", natural) and within half an hour to a terrible upper atmosphere that our guider couldn't cope with followed almost immediately by a mini ice storm and freezing fog. Tonight the seeing remains awful and highly variable but I'm sure the atmosphere will sort itself out soon. 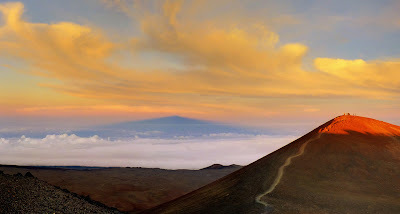 Down below, the conditions have been changing daily, but they did allow a quick view of the Hualalai volcano with little cloud between it and us at Mauna Kea's summit. 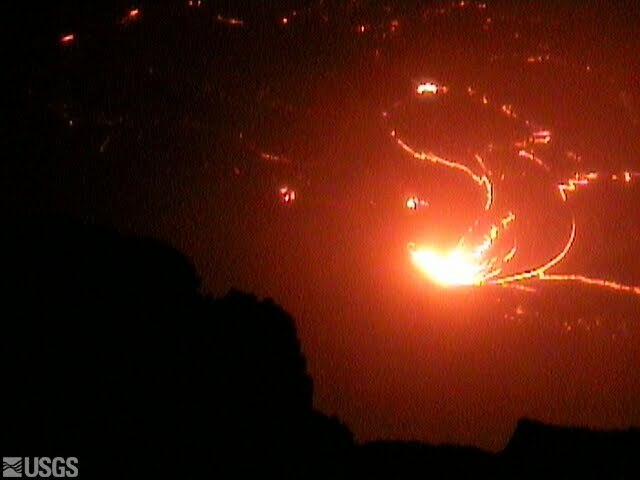 Unfortunately, the unusual evening view was spoiled by vog which you can see floating around below Haulalai's summit. Still, the vog does make for an unusual looking picture. With a weather system moving in the inversion layer is much higher this evening and there's a lot more low level cloud. 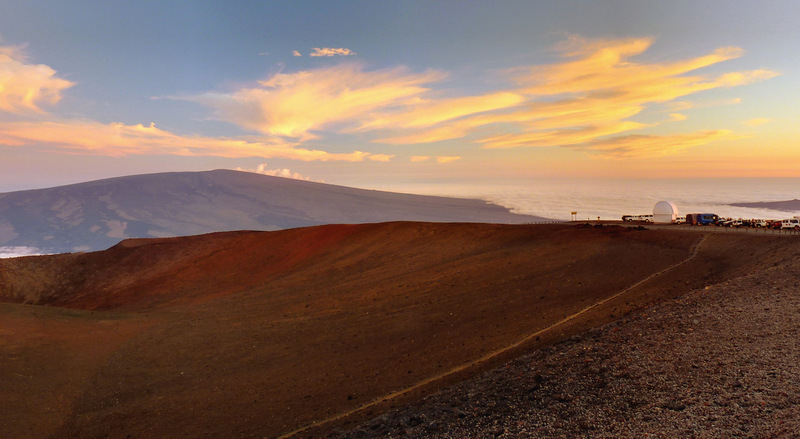 This means, unlike yesterday's amazing view, there's no ocean visible from the top of Mauna Kea. 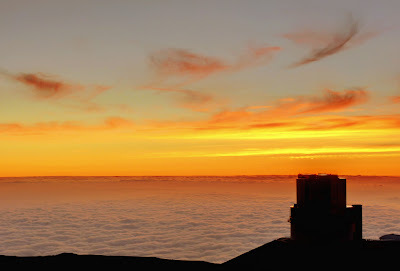 Instead, we have to make do with some of the other sights we get to see at sunset, such as the shadow of the mountain and anticrepuscular rays above, and below, colourful cirrus clouds to the west. Light from the setting sun reflects off the Pacific ocean thousands of feet below while crepuscular rays bathe the distant Kohala coastline. 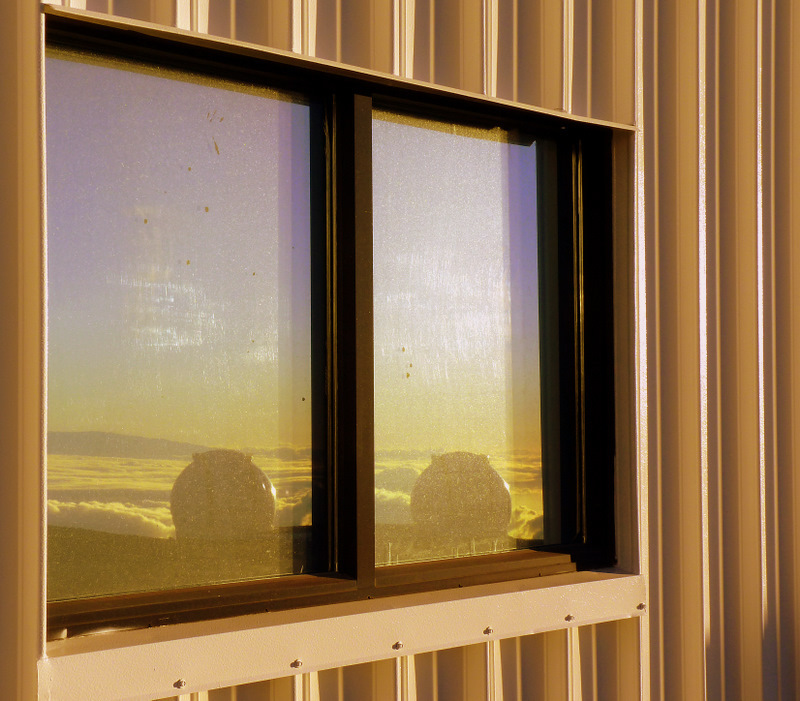 The silhouette of the Subaru Observatory sits in the foreground. Fortunately I'm not holding a large bolt in my hand and asking the engineers if they know which bit of the telescope it came from. Our engineering team put everything back together so precisely after our recent realumunisition work (see here and here) that tonight it was hardly necessary to make any adjustments at all in order for us to take science data again. 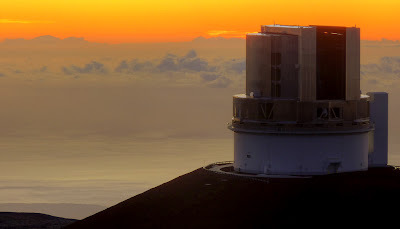 We were doing science observations just an hour after sunset on our first night back when in fact we had scheduled two and a half nights of engineering to get us up to speed again! We should be fully back in business at the start of tomorrow night I'm pleased to say. "Minimalist mode" almost sounds like some sort of new art fad or perhaps a new way of cooking nouvelle cuisine, but it's the term that's being used to describe the new operating mode that UKIRT will switch to at the end of the year. A few weeks ago I hinted that UKIRT would be undergoing the most significant operational change in its history and it's now official. The announcement is available under the "Latest News" section on the the UKIRT home page and you can read it here - "A Minimalist Operating Mode for UKIRT". The argument for switching to this new mode is actually quite simple. The Joint Astronomy Centre (JAC) runs both the JCMT and UKIRT and many resources are shared. The JCMT is currently commissioning SCUBA-2 which is a high priority project. If UKIRT were to close to save costs, then those resources are no longer shared and the costs for running the JCMT increase. The trick is to find a way to reduce the costs of UKIRT so that the savings equal the increase in costs of running the JCMT on its own. This is what minimalist mode achieves and in effect means the UKIRT delivers its excellent science for free. Well - perhaps a little simplistic but that's essentially the reason UKIRT survives for now and it also allows us some more time to explore future funding possibilities. Still, it's going to be a painful process for many because as the announcement says, staffing numbers will be reduced. The next few months are going to be quite challenging. 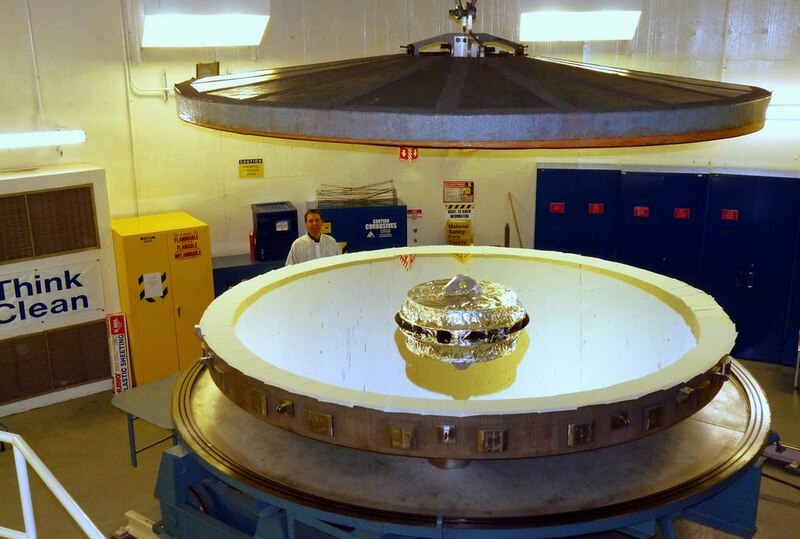 No, nothing to do with politics or voting, but our primary mirror is back at UKIRT with a beautiful new coating. Some of you may have read my post about our primary mirror being removed and taken to the CFHT for realuminising. Well, it was returned on Thursday after going through the process and I can't say how happy we are with the job the CFHT did. The coating is wonderful and our measurements showed that the quality is literally as good as gold at 3.3 microns, which is about the best you could get. No pretty pictures I'm afraid, just some snapshots of the day we got our mirror back, and I apologise for the odd colours from the CFHT clean room. UKIRT's primary mirror emerges from the vacuum chamber where it had been coated with a few hunderd Angstroms of aluminium (and I'm going to use the American word aluminum from now on!). This infrared scatterometer is what we used to confirm the quality of the new coating. Unfortunately it's rather unstable and as usual when scientists and engineers get together all sorts of theories, solutions and experiments were discussed, but finally we agreed that the mirror surface was giving us the same result as if it had been coated in gold. Erik, one of our engineers, is pretty proud of the result. He's been working here almost as long as I have by the way! The odd looking striations on the mirror had me panicing at first when I saw this picture, but they're simply reflections from the lab's wall. At least we know the mirror is reflecting stuff, which, after all, is what it's supposed to do! The mirror is very gently lifted from its support in preparation for its transport to UKIRT. I had asked our chief engineer beforehand if I needed to wear a hard hat while I visited the CFHT and he said that for this part of the work I should wear one. He then pointed out it'd probably be no use other than to help identify me after an accident. Now I know what he meant! This is several tons of glass being lifted. Finally, after a few hours, the primary is slowly lowered onto the truck. Everyone here is being extraordinarily careful because we can't risk any damage. We don't have a spare primary. Off it goes back to its home at UKIRT accompanied by our own security detail! It's only a few hundred yards between the CFHT and UKIRT but you have to remember it's a massive piece of delicate glass being transported on a large truck - you can't do this quickly. We also had to block the road for a short time to make sure some of the more enthusiastic tourists on the summit didn't hinder the operation and for the most part they didn't! The primary is now back in UKIRT's dome and we're planning a quick check of everything on Wednesday night which I'll be doing - we have to find those bits and pieces that everyone finds after putting something back together and wonders where this bit went. After that it's back on sky Thursday night and I have the privilege of getting everything working again. I'm looking forward to it because that's the one job I know I'm good at. I apologise for not posting this on Memorial Day earlier this week, but then again, this goes on all year round. I challenge anyone not to shed a tear while watching it. Thank you to everyone who serves in our armed forces and to those that have fought for our freedom in the past. 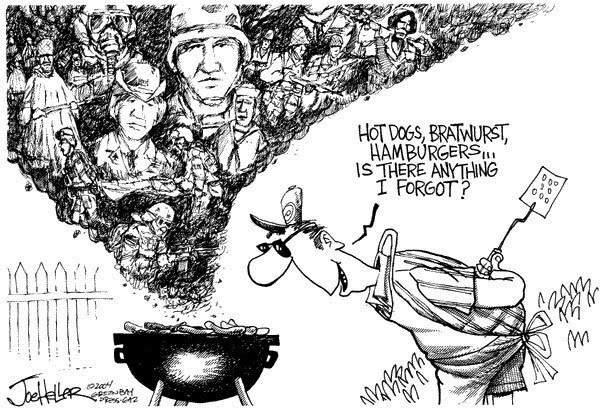 It also doesn't have to be a public holiday for us to remember those who died for our way of life. Please think of them at least once a day. Below are a couple of images from this evening. They were taken from the webcam placed on the edge of the crater of Pu`u O`o. 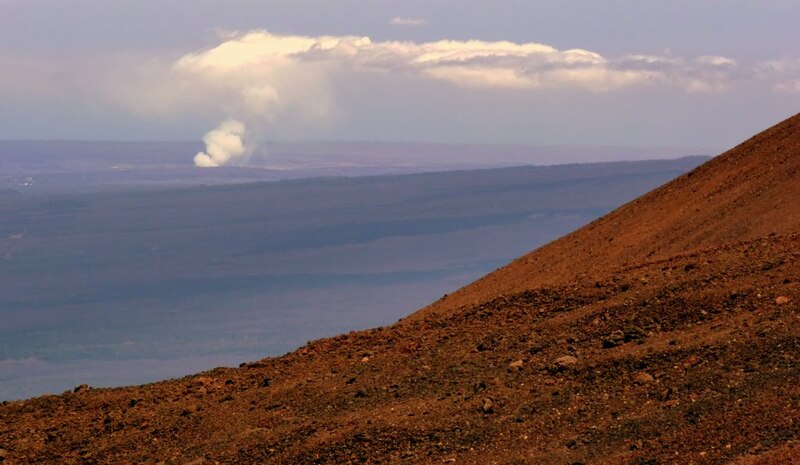 From Mauna Kea's summit today the plume from Kilauea's summit was very obvious (above) yet I couldn't see any plume from Pu`u O`o which is an active crater a few miles east-south-east of Kilauea's summit. It might explain why the webcam images are so clear right now because usually all you see is the thick plume.